I'm going to get an infrared imager from work and see if i can get a surface water temperature from it. Thanks for the quick replies guys! I just dropped the temperature on the heater and ill see how the tank reacts over the next day. I'm in louisiana and I'm actually running my air conditioner (not an uncommon thing for february here) and keeping my air temp at 70. Just started cycling a 10 gallon setup! Goal is a basic soft coral tank, maybe with a watchman goby/pistol shrimp pair. 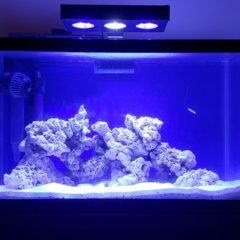 Running a moded aquaclear 70 with the hipargero aquaknight a029. Also have the hydor 240gph powerhead. Might be having one issue or two. My thermometer is giving me a reading of 86 degrees despite my heater being set on 80. 1. i may have bought a crap digital thermometer 2. My heater may not be properly calibrated from the factory. Its a 50watt aqueon. Any suggestions on how to troubleshoot which one is right or wrong?